The duchesses put on a display of unity, despite recent rumours of a rift. Source: Getty. 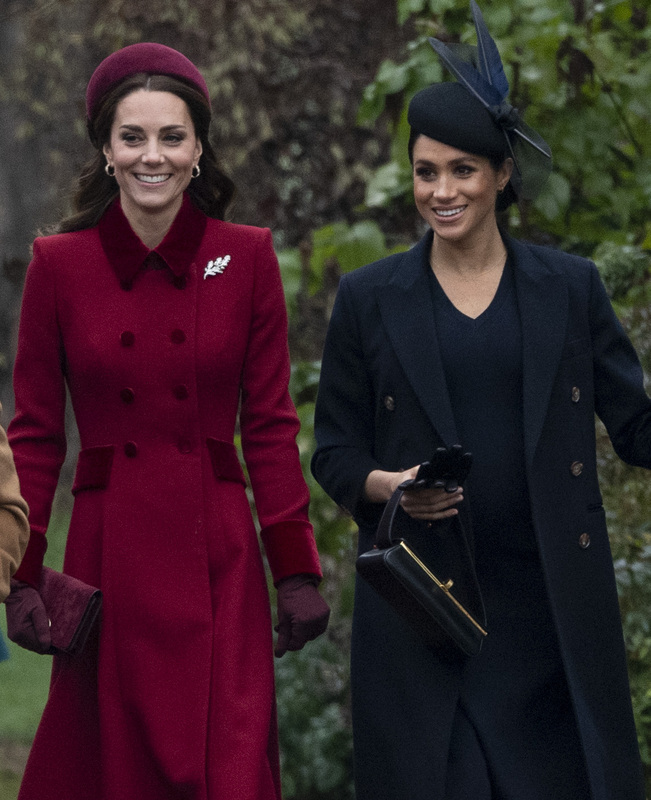 There have been rumours of a rift between the Duchess of Cambridge and the Duchess of Sussex recently, but the royal pair put on a show of unity on Tuesday as they joined the Queen for an annual Christmas Day church service in Sandringham. The duchesses stepped out with their husbands for the special occasion, joining the rest of the British royal family at church as crowds of well-wishers gathered outside the Church of St Mary Magdalene within the grounds of the Queen’s estate in Norfolk, UK. Catherine and Meghan walked side by side as the left the Church of St Mary Magdalene on the Sandringham estate. Source: Getty. Meghan showed off her blossoming baby bump in a figure-hugging navy dress, by celebrity designer Victoria Beckham, while she beat the bitter British cold in a long navy military-style coat, which she wore open at the front and an elegant feathered headpiece. The Duke and Duchess of Sussex, whose first child is expected in the spring, walked alongside the Duke and Duchess of Cambridge after the ceremony, having left their three young children at home for the morning. Catherine looked stunning in a 1940s-style crimson red coat, buttoned up at the front, with a matching headband and gloves in the same shade of red. The Duchess of Cornwall missed out due to a “heavy cold”. Source: Getty. 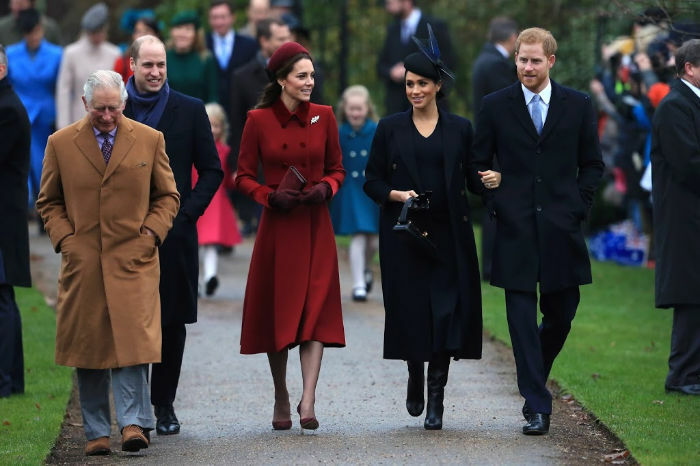 The two young couples were joined by the Prince of Wales as they walked through the grounds after the service, however the Duchess of Cornwall was notably missing from the annual event due to a cold. The Duke of Edinburgh was also unable to accompany his wife to church, as Her Majesty the Queen stepped out looking sensational in a pink and taupe outfit, complete with an impressive feathered hat. Read more: New royal Christmas photos: George, Charlotte and Louis take centre stage. While all eyes were on the duchesses, newly married Princess Eugenie also joined her grandmother and family at church, alongside husband Jack Brooksbank, as well as her older sister Princess Beatrice. The Earl and Countess of Wessex, who opted for a coat in a vibrant shade of blue, were joined by their children Lady Louise Windsor, who looked elegant beyond her years in a classic pill-box hat and tailored camel coat, and James, Viscount Severn. Read more: ‘Faith, family and friendship’: Queen’s Christmas Day speech unveiled. Princess Beatrice walked alongside Princess Anne’s daughter-in-law Autumn Phillips, who was joined at the event by her husband Peter and their children Isla and Savannah, and Beatrice’s father Prince Andrew. The Queen’s annual address also captured the hearts of the nation yesterday, as the monarch used the opportunity to urge her loyal subjects across the Commonwealth to treat one another with respect, despite any differences they may have. “Through the many changes I have seen over the years – faith, family and friendship have been not only a constant for me but a source of personal comfort and reassurance” she said. Do you attend church on Christmas Day? How did you celebrate Christmas this year?